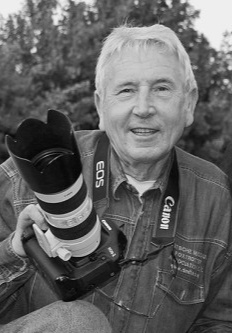 This is not about a wordsmith, but a photo-journalist, the great Hans Lehmann – the world’s first scoop photographer. Hans was born in Dessau, East Germany in 1939, but moved with his family to Wolfsburg, where he developed an interest in cars. He moved to Hamburg to start his career as a photographer, working freelance for an agency and the key German newspapers. He regularly returned home to visit his family in Wolfsburg. During a visit in 1963 he noticed a prototype being tested (in those days car companies did not bother to disguise prototypes), and he sold the photos he took with a 300mm lens to the German tabloid BILD. After this highly profitable deal, Hans had a new profession. He travelled to Death Valley, Australia, North Africa and the Arctic Circle. Hans had a three tier pricing structure. He got the most money from his top line customers who had first publishing rights; and when I was Editor of MODERN MOTOR magazine we got ‘second access publishing rights’ which allowed us to use the photo twice. His wife Christa, who did all the bookkeeping, also monitored the customers to check that they were sticking to the publishing rules. In May 1976 a single photo taken above the Arctic Circle arrived on my desk, and was to be the catalyst for what I consider to be my greatest achievement as a car magazine editor. For six months I had been researching a rumour picked up by my London Editor, Harold ‘Dev’ Dvoretsky, that Holden’s next new car in Australia may come from Europe. ‘Dev’ was not a great journalist, nor a news hound, but he had the most amazing network of contacts spread throughout the car industry in Europe, including Lehmann. 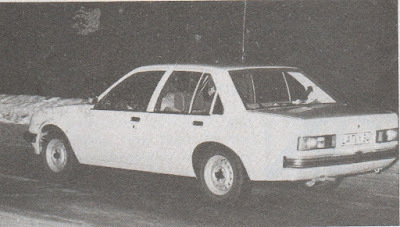 I began questioning my own ‘moles’ at Holden, and a picture began to form about the shape and size of the new car, and it was completely different to the current Holden sedan. As the research notes started to build, an image crystallized the minute I saw the rear three-quarter night shot Lehmann had sent. 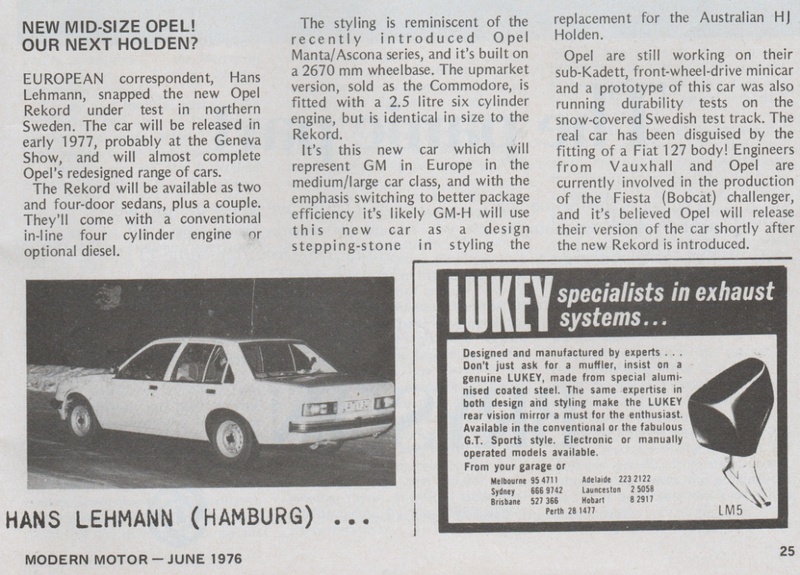 One of his contacts had told him the car was being developed by Opel and would be sold in Australia, and he included this gem (in German), as a caption on the back of the photo. By September of 1976 I had enough to put a story together, but just one photograph to hang it on. My resident part time artist at MODERN MOTOR was also a part time security guard, and one day he was visiting the Sydney Showgrounds to pick up his paycheck. At one of the pavilions he noticed an event accompanied by very tight security. He muscled his way into the Hordern Pavilion and immediately recognized what was happening. General Motors-Holden was conducting a research clinic for its planned new car, the Opel-sourced, Holden Commodore. Nobody from Holden saw anything wrong with having an extra security guard hanging around; but he stood for almost 30 minutes taking in the scene, and snapping photos in his mind of the silver design model. He raced the five kilometres from the Showgrounds to my office and bursting through the door, grabbed paper and pencils and sat at my desk, drawing the car from memory. And, here is the result. 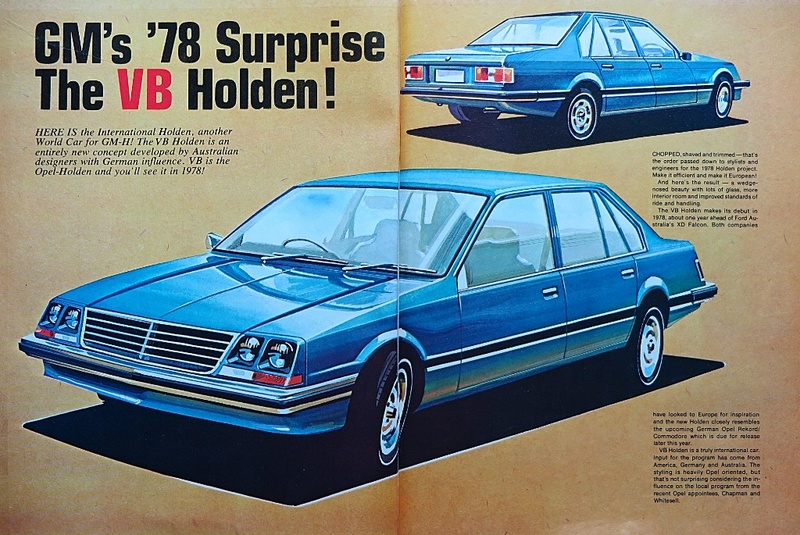 A major scoop on the new Holden Commodore, published in October 1976 – a full two years before the public launch of the car! Needless to say neither I, nor MODERN MOTOR, were flavor of the month in the GM-H Boardroom. The GM-H Chairman, Chuck Chapman; the Chief Engineer, Joe Whitesell; the Design Director, Leo Pruneau and the Sales Director, John Bagshaw discussed the appearance of the story, and decided the best way to deal with me was to ‘invite me into the tent’. I was invited to travel from Sydney to GM-H in Melbourne, where I would be lunched and presented with a complete briefing on the car, provided I did not use any of the information or fine detail we discussed, before the public launch of the car. Having already scored the news value of the scoop I agreed immediately; a secondary outcome was that I became very good friends with each of those directors for the rest of my life, and career, in the car industry. 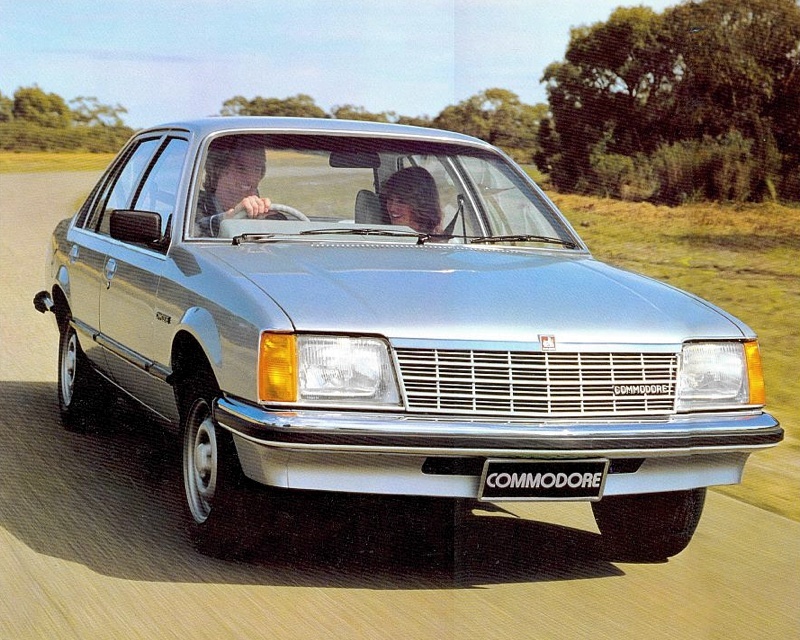 POSTSCRIPT: By the time the Commodore was launched in 1978 I had resigned from MODERN MOTOR to compete in the 1977 Singapore Airlines London to Sydney Car Rally with veteran adventurer, Hans Tholstrup. After the rally finished in September 1977 I joined Leyland Australia as its PR Director, a role I held for 14 years.